The month of January hadn’t been kind for the normally sharpshooting Kyle Korver, but in hitting the game-winning three against the Heat on Saturday, things may have turned around for the time being. Korver parlayed the momentum from the Miami win into Monday’s game in Memphis, where he torched the nets for a season-high 22 points, including 6 of 10 from long distance. Somewhat ironically, Korver credited Derrick Rose for helping him regain his stroke. That’s because with Carlos Boozer sidelined, the Grizzlies’ defense focused in on Rose. But it didn’t go so well for Memphis, as Rose recorded his first NBA triple-double with 22 points, 12 assists and 10 rebounds. “You wish those nights happened more often,” said Korver. “Those are fun. But I wasn’t doing anything special. They were really focused on Derrick and I was able to slide into the open spot. Coach Tom Thibodeau said he never lost faith in Korver, as whether or not his shots are falling, he helps the Bulls when he’s on the floor. 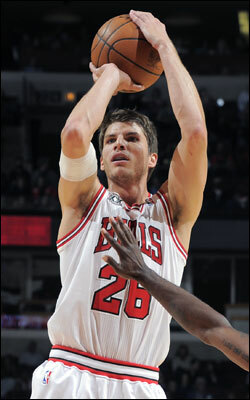 “In the last couple weeks, he’s had a number of shots go in and out for him,” said Thibodeau. “That being said, he still helps us a lot. People don’t come off Kyle, so it creates space for us. When you create space, it gives Derrick more driving gaps and Carlos [Boozer] more room in the post when he’s playing. So he helps us regardless of whether the ball is going in. In what’s become a recurring theme, different players have managed to shoulder a heavier burden at various times through this season for Chicago, whether it was Taj Gibson filling in for Boozer to start the year, or Kurt Thomas currently holding down the fort at center in Joakim Noah’s absence. Thibodeau says it’s a statement about how valuable the Bulls’ reserves are to the team’s success. In last season’s regular-season finale, Chicago defeated Chicago 98-89 to finish 41-41 and secure the eighth and final playoff spot in the East … Chicago is 9-2 all time against Charlotte in the Windy City and 6-5 versus the Bobcats in Charlotte … Chicago won last year’s season series 3-1, with the Chicago taking both games at the UC and splitting two games on the road … Derrick Rose posted 26 points, five assists and four boards, while Joakim Noah recorded a double-double with 11 points and 16 boards in their last meeting (04/03) at the UC … in 2008-09, Chicago lost the season series to the Bobcats 2-1 … Chicago’s lone victory came at the United Center on April 15, 113-106 … last season in their four meetings Chicago outscored Charlotte 98.8 to 95.0 and outshot the Bobcats .484 to .431 … since their inaugural season in 2004-05, Chicago holds an overall record of 15-7 against the Bobcats … the Bulls are 1-1 in overtime games versus Charlotte.